Picture is for reference only and may contain options or accessories that are not included. Vollrath, 40848, Countertop Electric Pizza/Bake Oven. This Vollrath 40848 Countertop Electric Pizza/Bake Oven is ideal for cooking pizzeria-style pizzas on your countertop. It heats evenly to ensure just-right browning of crusts and breads. Its shelves are 17-1/2, giving you ample space to place your pizzas, breads, and other baked goods. It has a 15 minute timer, two ceramic bake decks, and a 4 ft. 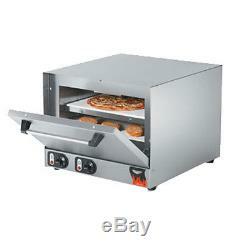 This Pizza/Bake Oven can be set anywhere between 140°F to 750°F for maximum baking flexibility. This permits you to create a distinct presentation for a variety of products. This 40848 is constructed from stainless steel for added durability and easy cleaning. Stainless steel exterior and interior for durability and easy cleaning. Includes two ceramic bake decks for crisp, even browning of crusts and breads. 140°F to 750°F heat setting. 17-1/2" shelf size with 2-1/2" clearance between shelves. Dimensions: 17" H x 19" W x 25 D. Most warranties are not valid if used at a non-commercial address. WARNING: This product may contain chemicals which are known to the state of California to cause cancer, birth defects or other reproductive harm. These items are delivered to your locations via a tractor trailer. You are responsible for offloading the merchandise and bringing your merchandise inside of your location. A lift-gate is a device used to raise and lower items from ground level to the level of a tractor trailer. These trailers are designed to load and unload at a loading dock or with a fork-lift. Usually this is a home, but it could be a church, farm community center, etc. Businesses run from a home are still considered residential. When you receive the item and sign for it, you own it. This is the only way you will be compensated for the damage! Inspect the outside of the packaging to look for dents or crushed corners. If you see anything even slightly suspicious carefully remove all packaging and inspect the item. The driver may be impatient but that beats having to settle for a damaged item. What if my item is damaged? This is often the best option if you need to get your item operational and the damage is cosmetic. If accepted, prior authorization must be obtained to return any equipment. Refurbishing, if necessary, will be an additional charge to purchaser and will be deducted from any authorized credit. The item "Vollrath 40848 Countertop Electric Pizza/Bake Oven" is in sale since Monday, December 5, 2016. This item is in the category "Business & Industrial\Restaurant & Food Service\Commercial Kitchen Equipment\Cooking & Warming Equipment\Ovens & Ranges\Pizza Ovens". The seller is "dougequip" and is located in Bluefield, West Virginia. This item can be shipped to United States.